Unlike a year ago when hurricane Ivan battered Pensacola's Five Flags Speedway, Hurricane Katrina spared the high banked half mile from any sever damage. Unfortunately for Mobile International Speedway, things are a little more bleak. Hurricane Katrina pummeled the Gulfcoast on Monday, leaving a nearly 500-mile wide path of destruction on an already battered coastline. As the clouds cleared Tuesday morning, damage assessments began. For track owner Ida Fields, the reality of the storm was hard to swallow. Debris from the front gate archway littered the parking lot upon first look. As Fields ventured further towards the track, it was apparent that there would be no racing in Irvington, Alabama for a long while. Other damage to the speedway included water and roof damage to the main scoring tower, missing roofs on other various buildings on the property, downed power lines, missing billboards and more. Electrical damage has not been determined because there is no power to the area and may not be for at least a week or more. As if it wasn't enough, Fields suffered extensive damage to her home as well. It has not been decided yet what to do with the remainder of the local division racing season, but Fields is determined to continue the tradition of the annual Lee Fields Memorial race, scheduled for September 17, named for her late husband and former promoter. Our thoughts and prayers go out to all of the people who have been hard hit by Hurricane Katrina. 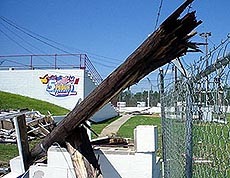 Last year, Five Flags Speedway suffered hurricane damage. This year, Mobile International Speedway was damaged. With just some minor damage to repair, promoter Tim Bryant has given the thumbs up for Friday's Coca Cola 100, which will be the fourth of five races in the 2005 Blizzard Series that will award the top two drivers in the point standings a provisional starting spot in the 38th annual Snowball Derby™ this December. Such drivers as Charlie Bradberry, Jay Middleton, Jeremy Rice and current points leader Eddie Mercer are expected to compete Friday night. The track has announced that $2 of each entrance fee will be collected by the track to donate to the Red Cross for relief work in the hard hit areas of the Gulfcoast. There will also be a trailer on hand that fans can fill with water, diapers, non perishable food items, first aid supplies and other much needed items that will be distributed on Saturday to areas in need.